Design, install and operate a sprinkler system with water-efficiency in mind. The 28th Annual Children's Water Festival will be at Front Range Community College May 22, 2019. School classroom registration is currently full for 2019. We have a wait list in the event that space opens up – registration is first come, first serve. Official registration for presenters or exhibitors is closed. If you would like to participate, contact Kayla, a2JldHpvbGRAZmNnb3YuY29t or 970-221-6241. Each spring, approximately 1,800 third-grade students and teachers from public, private and homeschools attend the festival which is sponsored by Fort Collins Utilities and Northern Colorado Water Conservancy District (NCWCD). 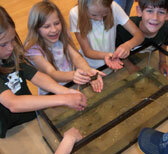 The festival is packed with fun, hands-on activities that teach students about water. Students spend half a day attending classroom presentations and visiting many displays in the exhibit hall. The Fort Collins Children's Water Festival is the longest-running festival in the state. For more information about the festival, contact Y2hpbGRyZW5zd2F0ZXJmZXN0aXZhbEBmY2dvdi5jb20=.